Cactus Sweeping can help you protect the value of all your commercial properties. We have served the Phoenix metropolitan area since 1998 and our clients include the area's largest shopping malls, business office buildings, and common areas for homeowner's associations. We're proud of our long-standing record of excellence in service. Our 100% satisfaction guarantee is a testament to our quality workmanship and professional training. We take pride and put time into every job regardless of its size. Let Cactus Sweeping, Inc. professionals keep your parking areas saying "Welcome to our business". We help you make a good first impression on your customers, and we keep your interior spaces fresh and free from trash, grit and dirt. When we perform Parking Lot Sweeping services, we look at the overall project and will include services such as: clean under parked vehicles; pick up large trash items by hand; and inform the property manager of maintenance issues that need attention. Our Dayporter services are designed to stay ahead of the daily clutter and trash that builds on most commercial properties. We will empty trach receptacles and replace plastic liners; dust storefront windowsills, directories, and can lighting; pick up trash in dumpter enclosures; remove parking lot trash; remove or clean any dangerous spills or broken glass on sidewalks. Call us if you have any special requests and we'll provide a detailed estimate. In today's highly competitive market, business property managers can't afford the tarnished image caused by cutting back on exterior grounds maintenance, and regular sweeping is arguably the most important component contributing to overall looks. Power Washing is one of the easiest ways to rejuvenate the exterior of your facility making it more inviting to potential customers or clients. Over time exteriors begin to lose their original luster without you even realizing it. Call us for a free estimate and evaluation so we can show you what power washing can do for you. Cactus Sweeping is proud that we are environmentally friendly and compliant with all EPA standards. 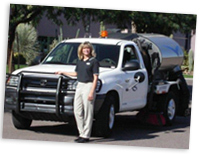 We are a family owned and operated business servicing the Phoenix metropolitan area.